In the world of iPad stands, sometimes the simplest design can be the best. Case in point, UK-based Pendle Products’s new iPad stand, which boasts a simple, clean design and can prop up your iPad in an inclined or reclined position with minimal fuss. 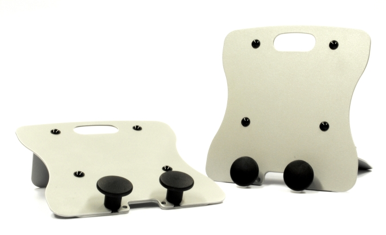 The £30 (approximately $47) Pendle iPad Stand is made from laser-cut steel and keeps your iPad safely in place with rubber and plastic supports. It maintains a tiny footprint on your desk while supporting your iPad in either landscape or portrait orientations. The stand can be switched from inclined to reclined in a matter of seconds, and while resting on the stand your iPad’s dock connector remains unobstructed, so you can easily charge and sync it.